The West Coast Burger at Assembly in Santa Cruz, CA, featuring artfully crispy bacon, cheddar topping and poutine fries as photographed by the HoosierBurgerBoy. Assembly in Santa Cruz beckons on a sunny afternoon along the coast. The doors open to a bustling downtown full off pedestrians. A breeze blows gently through the door. Chandeliers fashioned from deer antlers hang from the ceiling. This is a high-end dining experience. The burger is as well. After being seated, I order the West coast burger with home made brioche bun, cheddar spread, pickled onion, secret sauce, salad and fries. ($13.50) I add bacon for $3. Avocado is $2.50, but I decline. The burger comes with fries, but they also have Poutine with aged cheddar and duck gravy for $8. My server says she can make my fries into poutine. 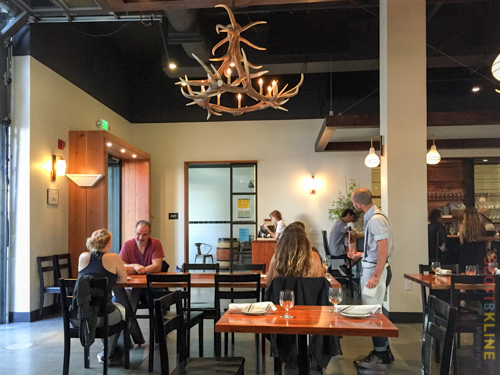 Antlers form a Chandelier at Assembly in Santa Cruz, CA. I order a glass of wine and wait for my burger as the restaurant starts to fill up. 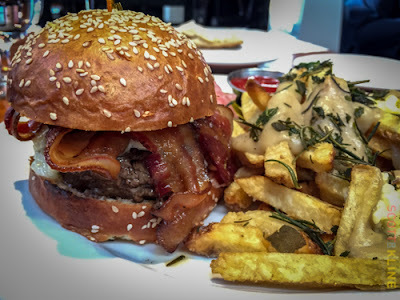 The burger arrives with bacon draped artfully around the patty; the smokey slices thin and crisp. The burger is grass fed and grass finished. It comes prepared to medium. Cooked perfectly, my burger tastes salty and delicious. The cheddar mixture gives a nice grace note of sharpness. I don't really taste the secret sauce, unless it's in the cheddar sauce. The bun holds together well under the juice until the last few bites when it falls apart on the bottom. This is a big win of a burger. The poutine fries are a work of art. The light duck gravy works as a condiment, not heavy and greasy but airy, salty and delicious it is spread sparingly over the hot, medium cut fries. I recommend this burger highly if you have the extra bucks and are in Santa Cruz looking for a great burger. There are lots of great things on the menu besides, so bring the whole gang and everyone can enjoy. 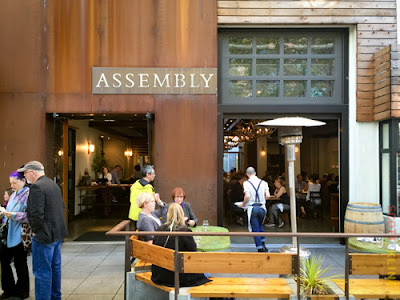 The front view of Assembly in Santa Cruz, CA. A great place to have a burger.